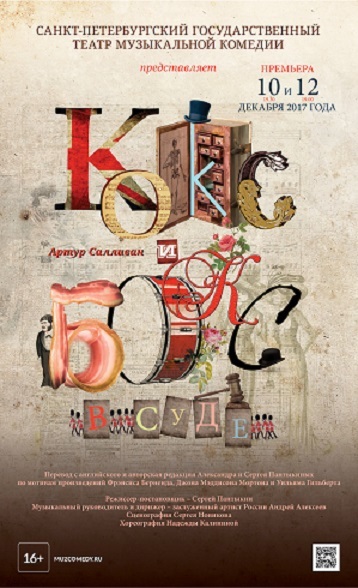 D'Oyly Carte » “Trial by Jury” & “Cox and Box” to be premiered in Russia. “Trial by Jury” & “Cox and Box” to be premiered in Russia. In December 2017, both Trial by Jury and Cox and Box will receive their Russian premiere. They have both been translated into Russian by Alexander and Sergey Pantykin and will be performed at the Saint Petersburg Theatre of Musical Comedy. The operettas will be performed in a double bill from December 10th. “In the new performance of the Theater of Musical Comedy, the authors linked two of Sullivan’s one-act operetta “Cox and Box, or The Long Lost Brothers” and “Trial by Jury.” Cox and Box will be performed first and then Trial by Jury in an evening of British Operetta.